Now is the best time to jump into Doctor Who. With a brand new cast, showrunners and brand new bells and whistles including a quality increase in special effects, the Series 11 premiere is a fantastic entry (or re-entry) point into the series. The Doctor was last seen at Christmas time in 2017 as Peter Capaldi’s 12th Doctor regenerated into Jodie Whittaker's 13th Doctor. What has followed in the year since then has been a very loud and obnoxious voice of 'fans' yelling and screaming about the fact the Doctor is now being played by a woman. Even though, it had already been explained in the show that Gallifreyans could regenerate into different races and sexes. Well guess what, Jodie Whittaker is amazing and although it'll take me probably the rest of the season the to decide where I place her up against the previous incarnations -- she's off to a charming, funny and fantastic start. We're introduced to the Doctor's new friends (not being referred to as companions anymore) for a lengthy period before the Doctor even makes her entrance. Ryan Sinclair played by Tosin Cole is instantly likeable. He is introduced to us as his Gran and step-Grandpa try to help him learn to ride a bike. Ryan suffers from dyspraxia, a coordination disorder which was not only something I hadn't seen from one of the lead characters on-screen before, but I was also interested to learn it's currently dyspraxia awareness week as the episode airs. This is fantastic timing as I'm sure more than just myself will be Googling the disorder to learn a little bit more. Sharon D. Clarke plays Ryan's Gran with a lot of charm and her Husband Graham played by Bradley Walsh is equally charming as soon as he's on-screen with Walsh bring a lot of gravitas to the screen which comes with his experience on nearly 300 episode of Coronation St I'm sure. The last of the crew is Yasmin who is played by Mandip Gill. Yasmin is a Police Officer and gets entangled in our crew when Ryan rings in a strange object he finds. When we first meet her she's dealing with petty crime and dreams of doing something bigger, which makes her the most obvious and easy click for the Doctor out of all the new crew. The Woman Who Fell To Earth plays out like a sci-fi horror movie at first. Our characters slowly being introduced and we learn of an alien presence. Then just when things look to be heading into a dire direction -- bam! The Doctor literally falls to Earth. Jodie Whittaker who was born in Yorkshire bursts into Doctor Who in Yorkshire as a character proclaims "we don't get aliens in Yorkshire." Well, you do now. Of course, you can't understate how many new things you are getting in this new series of Doctor Who from in front of the camera to behind. 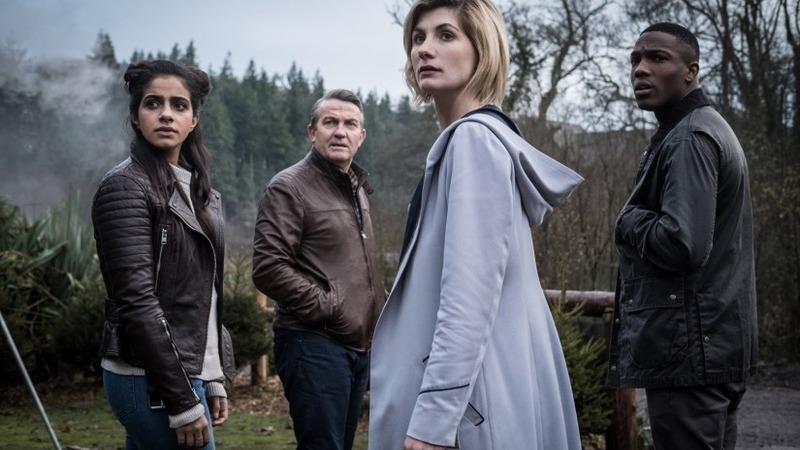 A female Doctor, a cast of characters of different ethnicities and genders and behind the camera, the same with the show having its first writer of colour this series after 55 years of making the show. When Russell T. Davies rebooted the series he brought with it a lot of things but most notably openly LBGTQ characters on-screen and as much as I enjoyed Steven Moffat's writing who took over as the head of the series following Davis, he didn't do much for moving the show forward in necessary ways as he could have. Chris Chibnall seems to be fixing a lot of the problems though and it's great to see. The show looks better than ever as well with great cinematography and an improved special effects from the new team working on Doctor Who from Double Negative, who most notably did the SFX on Blade Runner 2049. Steven Moffat also shot himself in the foot a bit with his very involved plotlines that I personally loved and equally hated at times, but understood how annoying they would make the show for newcomers. Well, if you're looking to start Doctor Who now is the time. Like a classic adventure The Woman Who Fell To Earth is an adventure focused on the human element first and then the Doctor comes crashing into it to help out. Who is she? They all wonder and if this is your first time watching the show you'll be able to safely join in and look forward to learning more as the series continues. The premiere episode is all about the banter and as with most episodes with a new cast, meeting them and getting the time to like them. The villain is fine. It reminded me too much of a variation of The Predator but it's kinda gross and sure to scare the kids a bit. With a refreshing feel to the series, a cast of new likeable friends for the Doctor and the Doctor herself being an utter joy, Doctor Who is back and better than ever.